This one is a sneaky one, and one that trips up a lot of authors if they aren’t paying attention. If you visit Amazon’s Look Inside feature, you might find your book formatting is completely different than expected. This is due to the Look Inside feature using a different software than the Kindle. In layman’s terms, Look Inside strips out a lot of the coding that makes a Kindle look pretty. 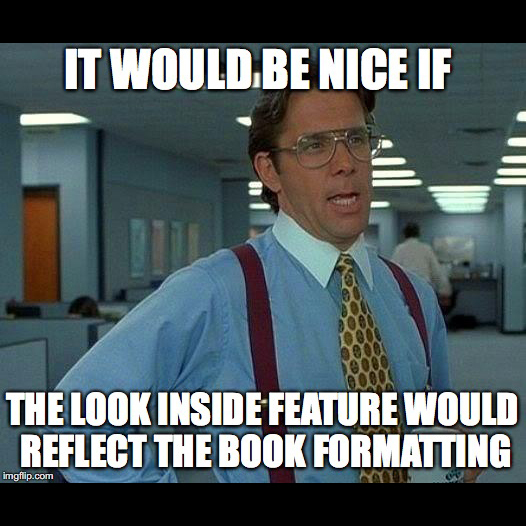 This is most often the case when a user is using Scrivener 2.0 to format their books. The best and most easy fix to this is to upload an ePub file to KDP. Or, if you have updated to Scrivener 3.0, they have fixed this issue with .Mobi files. If you’re using Vellum, they’ve also resolved this issue as well. The best course of action is always to check your file after it goes live to make sure you’re putting your best foot forward. Smashwords is notorious for throwing all kinds of errors at people. From images to text to Tables of Contents, you can find reams of complaints about people fighting with it. Happily, there’s a real easy solution to this problem: If you direct upload an ePub file (vice a Word document), you won’t have to submit to the Meatgrinder. Keep in mind that per Smashword’s own data, Kindle is the most-often downloaded format, and if you only upload an ePub file, you won’t get that .Mobi file for users of the Smashwords store. We wrote a whole blog on Smashwords, if you think you want to upload a Word doc instead. If you’re using CreateSpace and IngramSpark to publish your book, generally if one accepts your book format, the other will as well. The normal errors we get from IngramSpark relate to the color schema (as Scrivener exports PDFs in a different schema) and, on occasion, if we save the cover under the wrong Photoshop setting. Both of these issues are “non-blocking,” that is, Ingram will fix them for you. With CreateSpace, our most common error is the autovetter stalling when we upload the interior. CreateSpace will review the document and allow you to view the online version to check for any issues. Do you have any errors popping up when you format? Something just not working? Sound off in the comments!